Shyness is rooted in fear — an irrational fear of speaking up and being humiliated or ignored. Why are some people so afraid of speaking out? In my mind the main causes are oversensitivity and insecurity. When you associate speaking out with pain and embarrassment, you’ll do almost anything to avoid it. Unfortunately, shyness is an enormous detriment to success. For people who share this problem, it’s important to understand the causes and work towards overcoming it. For naturally quiet people, the fear of speaking can arise from a few bad experiences, especially at an early age. When an adult reacts angrily or dismissively to an attempt at self expression, it’s natural to take it personally and shy away from future expression. Even if this only happens once or twice, people tend to exaggerate these incidents until they become mental monsters. Growing up, it took me a long time to realize how self centered people are. The way someone reacts to something you say usually has nothing to do with you–it’s more likely a reflection of the mood they’re in or a recent event in their life. A key to overcoming shyness is recognizing these perceived slights for what they are–meaningless. When someone reacts to you negatively, don’t take it personally. Imagine the other person’s perspective. Is there something that may have put them in a bad mood? Are they trying to cover up their own inadequacy? Considering the perspective of the other person makes it easier to put their reaction in the proper context. It’s also essential to let go of bad experiences. When you dwell on a bad experience, it grows into something much more frightening than reality. Don’t do this to yourself! The more you think about a bad experience the more power you give it. Don’t blame yourself. Think about something constructive. The more you can fill your mind with positive memories of speaking up the easier it gets. Another important step in overcoming shyness is realizing that other people are basically the same as you. Everyone is insecure and afraid of embarrassment. Other people usually aren’t as smart as you think. If you have a question, chances are someone else is wondering about the same thing. Don’t let one or two bad experiences dictate your entire opinion of humanity. By and large, people are friendly and interested in connecting with others. They’ll respond favorably to your attempts at communicating. In most cases, people will be thrilled that you took the initiative to break the ice. 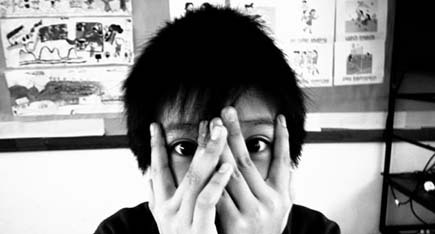 The second cause of shyness is insecurity. If you don’t think you have anything valuable to contribute, what’s the point of risking embarrassment? To get over this you need to recognize the merit of your own thoughts and the value they present to others. It’s ironic that the people most inclined towards shyness are often the most thoughtful. To reach your potential, you need to share yourself with the world. Your brilliant insights don’t hold any value until they’ve enlightened someone else. The best way to get accustomed to sharing is practice. Force yourself to speak up, especially when you don’t want to. Sit in the front of the room and make yourself visible. Understand that sharing your insights with people is doing them a favor. Once you get used to opening up, you’ll notice how positively people react. This will build your self confidence and faith in the goodwill of others. Overcoming shyness isn’t just something you should do for yourself, it’s also part of being a contributing member of society. When you have a thought or idea that deserves to be heard, you’re not only hurting yourself by keeping quiet, you’re hurting the people around you. A basketball coach once explained to me how passing can selfish. If a player has an open shot that she can make, and she decides to pass instead, that player is being selfish and hurting the team. When you pass up the chance to excel because of shyness or the fear of failure, you’re hurting the group to shelter yourself. Other people need you. They need your intelligence and insight. They need your help to work through problems. By hiding behind shyness, you limit the help you can give to your friends, family members, and colleagues. A college professor of mine used to make a big deal about overcoming shyness. He called it a, “silly, foolish habit,” and said, “the sooner you can break it the better.” Shyness doesn’t benefit anyone. Saving yourself a little embarrassment doesn’t amount to much in the long run. By overcoming shyness, you give yourself the chance to be recognized and promoted. You create opportunities and open yourself up to forming meaningful relationships. Don’t keep your talent inside, share at every opportunity so it can grow and flourish.